Minister for Health and Minister for Ambulance Services Steven Miles congratulated the new graduates on their placements, with more than 1,350 joining the Queensland Health family across the state this year. “They’ve chosen incredibly rewarding careers, ones that help people get better and improve their wellbeing,” Mr Miles said. “Nurses are among the most trusted frontline professionals. They can make a real difference to the quality of care delivered to patients. Metro North Deputy Board Chair Dr Kim Forrester also welcomed the graduates. 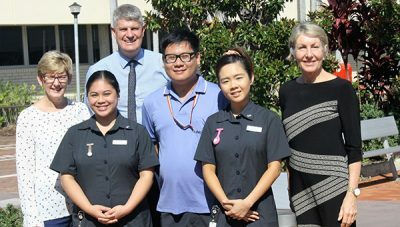 “It’s great to see so many new nurses starting their careers right here at Brighton Health Campus,” Dr Forrester said. “This is going to be a very important year in their careers and they’re going to make such a difference to our resident’s and patient’s lives. “It’s an exciting time for these graduates who will work across several clinical areas including transitional and residential aged care for the elderly, and specialist rehabilitation services for people that have suffered trauma or a severe brain injury. For Graduate Registered Nurse Anita Kubel, the choice to work at Brighton Health Campus and in a community setting wasn’t difficult as she was an Enrolled Nurse with the community-based Complex Chronic Disease team previously. Anita will perform two six-month rotations starting at Brighton’s Interim Care, and finishing at Residential Transition Care at Zillmere, a service that supports the elderly transitioning back into the community following a hospital stay. “I enjoy working in a community setting because you get to see most of the patients getting better and going home following a lengthy stay in hospital,” Anita said.